Talking about yourself is never easy -- and writing a great bio can be one of the most challenging parts of developing a solid online presence. To help you out, we've put together a few guiding rules of thumb to keep you on the right track. What motivates you? Why do you do what you do? What do you care most about? What is it that gets you excited to work on a new project? Adding something about your passions allows your page viewer to connect with you on a human level. People naturally gravitate towards people who are passionate. What are your goals? What do you hope to achieve? What kind of impact are you trying to create in the world? Letting people know what your goals are will make it easier for people to see where you're going and where you align. What have you done that shows impact resulting from your passions? What kind of work have you produced? These types of supporting details will reinforce the fact that you've created impact before and will be able to again. Add something unique about what who you are outside of "your real job." What do you like to do when you're not working? What's something that you could connect on with anyone, even if they don't work in your industry? Use your natural voice. The most effective bios are ones that the reader can connect with. Make your page viewer feel like they're meeting you in person while reading your bio by using the same kind of language you'd use while speaking to a person in conversation. 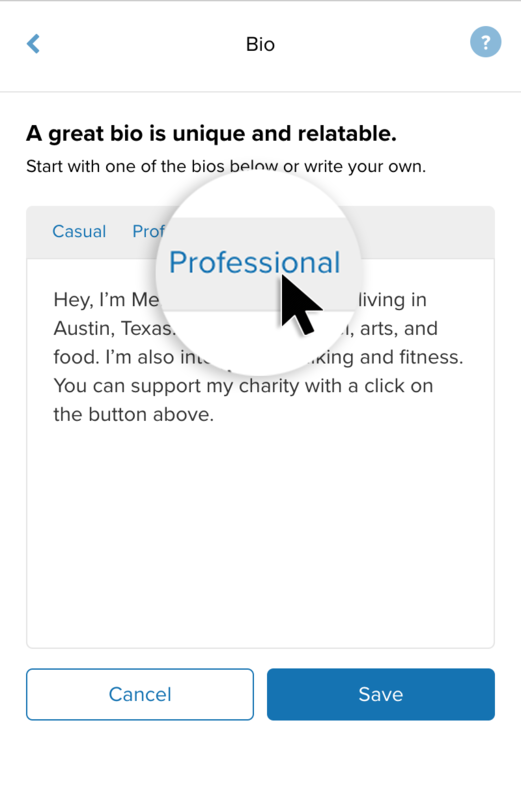 If you're hitting writer's block or looking for a quick fix, give Bio Writer a try by clicking 'casual' or 'professional' at the top of your Bio box.